Vintage Advance sewing pattern 5413 for girls and boys. 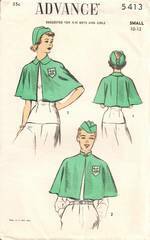 Cape with Peter Pan or military collar. Two syles of hats. Pattern is used and complete. Unprinted, precut pattern pieces. Undated l940's to early 1950's.